My mother was diagnosed with Multiple Sclerosis when she was 33 years old following what she thought would be a routine eye exam. Her eye doctor thought he saw abnormalities during the exam, and after additional testing, she was eventually diagnosed with Secondary Progressive MS (SPMS). I was a year old at the time. The early stages of her disease were characterized by a remittance-relapse course, but eventually progressed in to a steady worsening of neurologic function. I don’t remember a time of my childhood that my mom was able to walk without the aid of a cane or walker. Eventually she became confined to the use of a wheelchair, and in the last few years of her life, she became bedridden. Although she faced many battles on a daily basis, she always had a smile on her face and was the rock of our family. I have never met someone so full of faith, strength, determination, and grace. To be even half the women she was is what I strive for on a daily basis. She was my biggest fan. She is my hero. She was a true MS Warrior. I have been a runner for over half my life. I love running and everything that it represents. I grew up as a cross country and track athlete. I loved the competition, camaraderie, friendship, and lessons it taught. So many things in life can be related to running…working hard, dedication, perseverance, and mental toughness. So much of who I am has come from running. As I have gotten older and added the roles of wife, mom, friend, and full-time job, running allows me to remember who I am and helps me to fulfill those roles to the best of my abilities. Although I have transitioned out of team sports, I still very much enjoy racing and pushing myself through various running distances including 5k, 10k, and half marathons. I also now officially have 8 marathons under my belt! 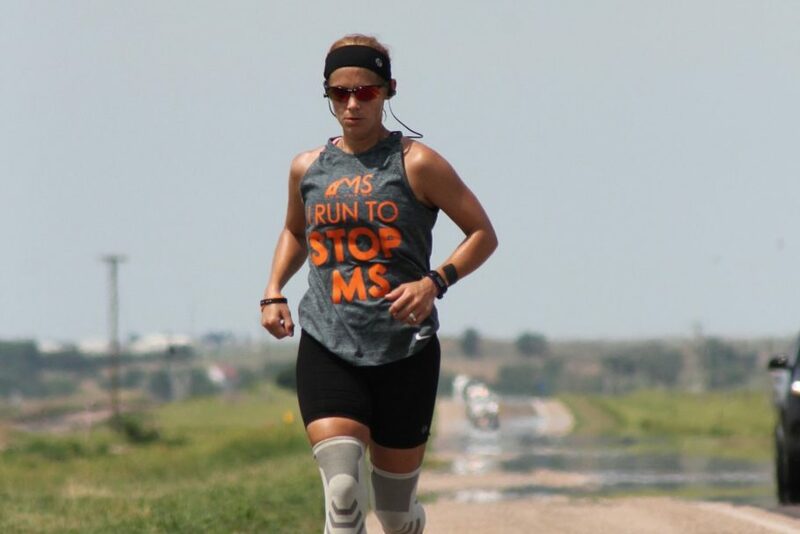 I am so honored to be running for the second year in a row for MS Run the US. The 2018 Relay experience as the Segment 9 runner was nothing short of life changing and one I will never forget! The physical and mental aspects I embraced and overcame were the most rewarding accomplishments I have ever reached. But, the passion I have found for this cause and the amazing people I have had the honor to meet over this past year are something that I hold very near to my heart and am more grateful for than words can say. I am so excited for the opportunity to reach more people through our awareness efforts and help bring light to this disease and those still being affected. We still have much work to do, but together I know we will find the CURE!! Hobbies: I am a Certified Personal Trainer and Coach. I enjoy coaching both my kids in whichever sport they are participating in as well as at the middle and high school level. This year I was named the Head JV Coach for our local high school. I also enjoy weight training and running whenever I can find the time!